Creating a marketing video is an exciting process. Your team spends weeks refining the message. The producer brings your concept to life and, after a few suggestions and revisions, sends you a video that really nails your vision. By the time all the key players sign off on the final video, it’s truly a marketing asset your team can be proud of. The challenge now? Getting people to watch it. That’s where YouTube SEO comes in. YouTube isn’t the only place people will be able to view your video, but having it on the second largest search engine in the world has its benefits. Google owns YouTube, and as a result, videos posted on the video sharing platform perform better in Google searches. Using YouTube SEO tactics is an easy way to further lift your video in organic search results. Let’s walk through the steps. YouTube SEO, like traditional search engine optimization, relies on keywords to deliver relevant results to users. Those keywords are going to live in your video title, video description, and tags. If you’ve done some work optimizing your website for search, you already have a list of keywords you are ranking for. Or if the video is supporting a specific campaign, you may have done some keyword research specific to that effort. From those lists, select one or two keywords that best fit with the video’s subject matter. Next, write a title that includes your selected keyword. But our video already has a title, you say? Don’t worry. It’s not uncommon for marketing videos to use a different YouTube-optimized title than the official title of your video. Make the YouTube title descriptive and something people will want to click on, and try to keep the length under 70 characters, including spaces. Anything over that character limit will be truncated in most search results. Take a look at the titles GoPro uses on its YouTube channel. The first word in every single one is GoPro. 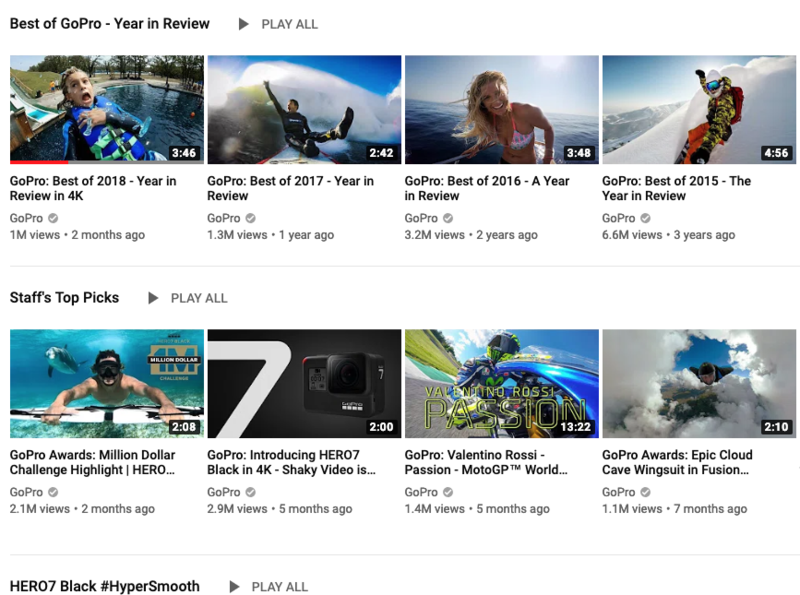 There are lots of GoPro videos posted to YouTube every day, but the company that makes this fun camera wants its videos to hold the top spots on the search results page anytime someone enters “GoPro.” Adopting this naming convention (and tons of cool content) has helped the brand build a 6.7 million subscriber list. YouTube’s Creator Academy encourages users to provide thorough, useful descriptions to get more views. The great thing about YouTube is it gives users tons of space for video descriptions—a maximum of 5,000 characters! That’s roughly 1,000 words you can use to talk about not only the video content, but your company, products, and services, sprinkled with your selected keyword. While you probably won’t use all that space, aim for a description that’s at least 150 words, and as always, avoid keyword stuffing. Using it two to three times is enough. Here’s a format for writing descriptions we’ve found useful to maximize YouTube SEO and entice viewers. Body – This is where you can get into greater detail about the video content and talk more generally about your company. Keep the tone conversational and make the content easy to read with small paragraphs or bullet points. Call-to-Action – This is your opportunity to direct people to a landing page, download an app, or take some other relevant action. Links – Use this space to tell people how they can learn more about your company, via the website and social media channels. Here is where some companies will put their boilerplate as well, which is fine, but keep in mind that having the same exact content for each video will hurt your SEO more than it helps. If you do use boilerplate, make sure each video has a unique introduction, body, and call-to-action. 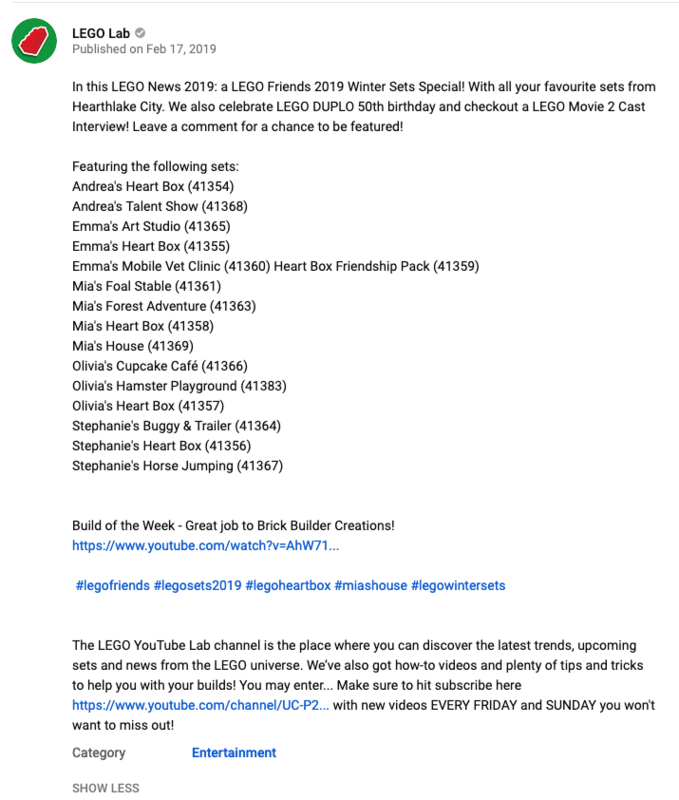 LEGO is one of the most popular brands on YouTube with 7.2 million subscribers. This description lets you know what to expect and even sneaks in a call-to-action at the end of the intro! There’s a list of all the sets seen in the video just in case you want to buy later, as well as a link to related content. It closes with some hashtags (more on that below), some boilerplate, and a CTA to subscribe. How tags relate to SEO can vary depending on platform, but on YouTube, tags are especially useful. They help YouTube know what your video is about and are another way to help YouTube drive your content to a relevant searcher’s query. The “don’t overuse keywords” rule still applies here. Five to 10 tags in each video are enough to optimize your video. Hashtags are another way people can search for your video. 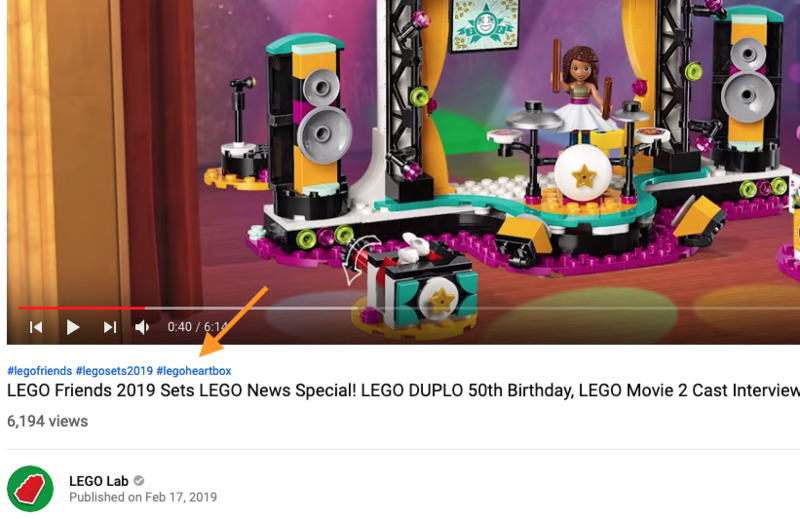 When added to the video description, they will appear as a hyperlink, allowing the user to click on it to view other content with the same tag. Another bonus, the first three hashtags used will appear as hyperlinks above the video title (see above). It’s another way YouTube hopes to improve the user experience and help people find the videos they want. I know we’ve said this before, but you definitely don’t want to overdo it with hashtags. YouTube will ignore all hashtags in a video description if there are more than 15, and overuse of hashtags can result in removal of your video! If you’d like to look at some of our videos and how we wrote our titles, descriptions, and tags, check out our YouTube channel, or reach out to us with your questions. You and your team put a lot of work into that marketing video, so why not get the most out of it with a little YouTube SEO?